The overheated residential property markets in 15 key cities in China "obviously cooled down" in November, said a research report from the National Bureau of Statistics on Monday, based on housing price data from 70 monitored cities. 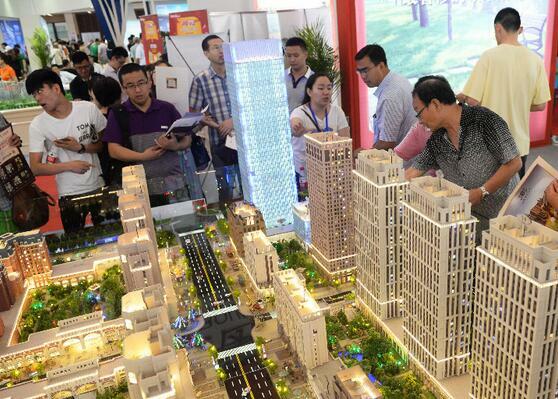 Prices of newly-built properties went down in four cities, and prices of pre-owned properties declined in seven, showing that measures by various cities to use steps appropriate to local conditions to curb too fast growing housing prices have been effective, and housing prices are stabilizing, said Liu Jianwei, senior statistician with NBS. Average housing prices dropped the most in Chengdu, by 0.8 percent. Shenzhen, Chengdu, Urumqi, Baotou, Mudanjiang, Luzhou and Nanchong also saw drops, said the report. In key cities, housing prices remain basically the same as last year, said Liu. The average price of newly-built residential properties went up 0.1 percent month-on-month in first-tier cities, while the price of pre-owned properties remained the same. In second-tier cities, the growth of housing price was curbed, with the average price of newly-built properties rising slightly at 0.4 percent and pre-owned properties 0.3 percent month-on-month, versus 1.2 percent and 0.8 percent in October, said Liu. Lower-tier cities' housing prices are stable, too, said Liu. More than 20 cities have introduced various policies against speculative buying in a bid to curb too fast growing housing prices and to make sure housing prices are developing in a steady and healthy manner. Market players said that because cities are likely to adjust policies to manage property markets based on their specific market conditions. China's housing markets are still diverging as key cities' prices are rising and lower-tier cities face high inventory. November data reinforce the October data that indicated a rapid slow down in price growth in some of the leading cities, especially those that recorded faster growth for the majority of 2016. Nevertheless the slowdown seems to be more muted in lower tier cities, which weren't subject to the same restrictions, with price growth actually picking up in some of the smallest cities," said James Macdonald, head of China Research. Analysts said "turning points" of housing prices are showing in some key cities for the first time in the last 12 months. That is, their average housing price in the second half of a month is lower than in the first half of the month, reflecting a downward trend. In Beijing, Shanghai, Shenzhen, Nanjing, Hangzhou, Xiamen, Fuzhou, Tianjin and Wuxi, which have seen fast housing price increases since late 2015, housing price growth turned negative in the second half of November, compared to that of first half of November. "We expect that in some cities, fast growth of housing price will turn to slow growth and even slight declines in November and December," said Zhang Dawei, an analyst with Centaline Property in a research note. The overheated residential property markets in 15 key cities in China "obviously cooled down" in November.